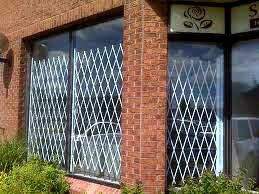 Window Gates Are Custom Made & Designed To Help Prevent Burglaries & Intrusions! Window gates offer a greater resistance to criminals and peace of mind for you when it comes to protecting your business or family from intruders. Keep in mind that most burglaries are a spur of the moment act and burglars are always on the lookout for an easy mark that has inadequate security protection. Statistics show that businesses and residences with extra security measures such as security gates on windows and deadbolt locks on doors are ten times less likely to be burgled than those with no security measures. Window gates when installed properly are a very good investment. There are a number of different applications of window gates including store front glass doors, retail window displays or residential sliding doors. Our Custom Made Steel Galvanized Window Gates Are 100% Made In America! Call us for a FREE window gate design and installation quote.